At Last...A Complete Martial Art, Combat Sambo System That Can Be Used For Grappling Arts And Mixed Martial Arts! Russiansambo.com was created to help spread Sambo to everyone in the World. Our Sambo approach will be used in Sport Sambo, Combat Sambo, Self Defense Sambo, Mixed Martial Arts (MMA), Brazilian Jiu Jitsu (BJJ) No-Gi Grappling, Submission Wrestling and Judo. Morley and Koulikov guide clients and students through functional and personalized training methods that focus on instruction, explanation and application, to achieve the highest understanding and best performance results. Hi, my name is Lucas Morley and I started training Judo when I was 3 years old in Rio De Janeiro, Brazil. But through trials and turbulence and moving from Brazil to Ecuador and then the United States, I was able to keep training here and there...barely. In 2005 I moved to Port St Lucie, FL and had no Judo to train. So I found the only thing around which was Shootfighting. Shootfighting to me looked just like MMA and they focused ALOT on leglocks. Thats where I fell in love with leglocks. Marc told me to look into Sambo if I liked Leglocks so much...so I did. I found out how Sambo was very similar to Judo, had all the Judo throws and MORE! Plus it had more leglocks that I knew what to do with. I started to fly to New York to train with Master Vladislav Koulikov of Ultimate Sambo which is a Sambo Master and 2nd Degree Judo Black Belt under the USJA. At that time I was a Brown belt in Judo so it really helped me progress in Russian Sambo. Master Koulikov taught Combat Sambo, which includes, throws, takedowns, armbars, shoulder locks, lecklocks, kneebars, punching, kicking, elbows, knees, gun defense, knife defense and club defense. It covered it ALL! The thing that impressed me the most with the throws was all the grips that sambo had to offer that they really didn't cover in Judo like Russian 2 on 1, Russian Belt grip and throws to submissions like leg locks and arm bars. I was completely hooked in this martial art. While on my road in Combat Sambo, I started training Brazilian Jiu Jitsu with Master Renato Tavares a 5th Degree Brazilian Jiu Jitsu Black Belt under Carlson Gracie. Mater Renato opened up my ground game to complement the art of Russian Sambo and Judo that I had. Combining the 3 BEST Grappling martial arts in the world I now can help those beginning or dedicated veterans to form their complete game from Top to Bottom. This also gave me the chance to open my on Martial Arts Academy in Port Saint Lucie, where any of you are welcome to train at. Leg lock Counters and Much More! Russian Sambo will be available for students and coaches of every gym. 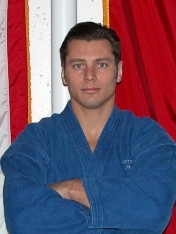 Lucas Morley will assist in training and coaching students virtually, through privates and seminars. Morley will incorporate Combat Sambo, Sport sambo, Self Defense Sambo and Judo to any martial art school or single student interested in building more value to their already existing curriculum or fight game plan. Contact Us Now for Seminars, Privates or Long Distance Training! Russian Sambo and Mixed Martial Arts (MMA) is a serious business and you should find a qualified Russian Sambo school and instructor to properly guide you through the correct methods of training Sambo. Students get a great workout as Russian Sambo uses the entire body. Men, Women and children will benefit from training in Russian Sambo and Judo. No matter what your goal may be, if its for fitness, self defense to have a good time or just to make new friends you will love our Sambo curriculum and techniques. As we have helped our students' in a way that they have bettered their abilities, we would like to do the same for you and your students. We believe that martial arts plays an important part in the development and building of moral character, good ethics, and sportsmanship. These reasons, along with the ability to defend oneself, are immeasurable and beneficial to all.